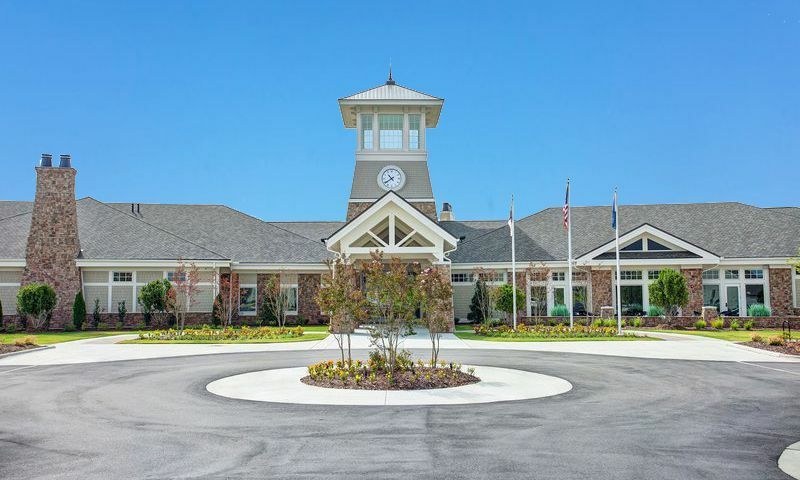 Carolina Arbors is an exciting Del Webb community for active adults aged 55 or better in Durham, North Carolina. Situated in the center of the Triangle Area of Durham, Raleigh, and Chapel Hill, the community is nestled near shopping, dining, golf, world-class entertainment, universities, and the finest medical centers. True to Del Webb’s reputation, Carolina Arbors offers a truly carefree, active lifestyle for its homeowners. Every low-maintenance home was designed with spacious living areas and ample storage. The community will feature world-class amenities in a 34,000 square-foot clubhouse that caters to active adults’ needs. Carolina Arbors has a grand clubhouse equipped with a numerous amount of resort-style amenities. Here residents will have exclusive access to a state-of-the-art fitness center, library and lounge, ballroom, billiards room, arts and crafts room, indoor and outdoor pools, and a demonstration kitchen. The clubhouse is the central social point, where residents can gather for a multitude of activities. The amenities will continue outdoors with miles of walking trails and multiple courts to play pickleball, tennis, and bocce ball. The community will even have a botanical garden and a community garden for residents with a green thumb. Del Webb began construction of Carolina Arbors in 2013 and upon its completion plans to encompass about 1,256 low-maintenance residences. Active adult homebuyers can select a floor plans from three from model collections. The Passport Collection offers four floor plans that range from 1,152 to 1,424 square feet in size with one to two bedrooms, two bathrooms, and an attached two-car garage. The Expedition Collection offers four floor plans that range from 1,620 to 2,264 square feet with two to four bedrooms, two or three bathrooms, and an attached two or two-and-a-half car garage. The largest homes are found in the Pinnacle Collection with four floor plans that offer two bedrooms, two bathrooms, and an attached garage in homes that range from 2,155 to 2,562 square feet in size. Owning a home in this beautiful community means living in high-quality residences without having to worry about mowing or landscaping because the homeowners’ association fee handles these chores. Homeowners will find that Carolina Arbors is the perfect place to enjoy their active lifestyles. The community will have a social activities director that will keep a calendar full of events and activities year round. Some favorite activities of residents include bridge, bunco, bowling, and bible study. Additionally, Carolina Arbors’ close location to Duke University, NC State, and Wake Tech North Campus allows residents to continue learning with informal classes for active adults with a wide variety of subjects that range from creative writing to interior design. Carolina Arbors is situated in Durham, North Carolina on 460 acres. Residents enjoy living in the Triangle Area of North Carolina where daily necessities and exciting attractions are all within a close proximity. Golf lovers will love living a short drive away from Brier Creek Country Club, Lonnie Poole Golf Course, 12 Oaks, Wildwood Green Golf Club, Falls Village Golf Course, and The Crossings. The community is also located less than two miles away from Brier Creek, which offers shopping and dining. Del Webb in Durham is a great option for active adults looking to purchase home in Carolina Arbors, NC. Piedmont Hall - 37,000 Sq. Ft. There are plenty of activities available in Carolina Arbors. Here is a sample of some of the clubs, activities and classes offered here. The Passport Collection offers four floor plans that range from 1,152 to 1,424 square feet in size with one to two bedrooms, two bathrooms, and an attached two-car garage. The Expedition Collection offers four floor plans that range from 1,620 to 1,961 square feet with two to four bedrooms, two or three bathrooms, and an attached two or two-and-a-half car garage. The largest homes are found in the Pinnacle Collection with five floor plans that offer two bedrooms, two bathrooms, and an attached garage in homes that range from 2,155 to 2,562 square feet in size. Carolina Arbors is an amazing place to call home. The residents are the nicest people you will ever meet and are incredibly welcoming. The floor plans are fantastic with great kitchens and oversized closets. The Clubhouse will take your breath away - the pools, fitness center, swimming pools, and clubrooms are phenomenal! 55places.com is not affiliated with the developer(s) or homeowners association of Carolina Arbors. The information you submit is distributed to a 55places.com Partner Agent, who is a licensed real estate agent. The information regarding Carolina Arbors has not been verified or approved by the developer or homeowners association. Please verify all information prior to purchasing. 55places.com is not responsible for any errors regarding the information displayed on this website.